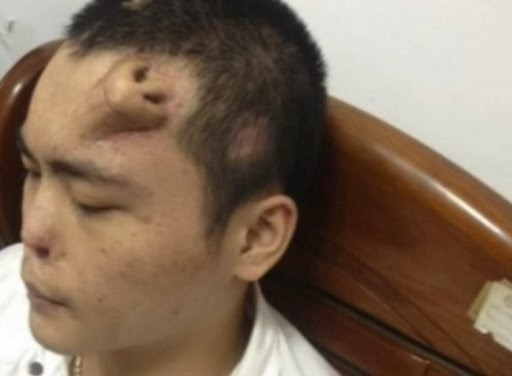 Solution Tender: A Man in China Who Is Growing A new Nose On His Forehead. A Man in China Who Is Growing A new Nose On His Forehead. The man suffered damage to his nose and an infection after a severe car accident, and the infection had eaten away at the cartilage in his nose, making it impossible to for doctors to fix his original nose. Instead, the team decided to grow the man an entirely new nose on his forehead, according to the Huffington Post. But despite its extreme appearance, this method is not that different from plastic surgery techniques used all the time, said Dr. David Cangello, an attending plastic surgeon at Lenox Hill Hospital and Manhattan, Eye Ear and Throat Hospital in New York. "I would call it a different take on a principles that we commonly use in reconstruction," Cangello said. The man's doctors placed tissue expanders, which create space to stretch the skin, under the man's forehead, and created the rough shape of a nose, probably using screws and plates. They then harvested cartilage from his ribs to fill in the nose. Once the nose is ready, they will rotate the entire assemblage — skin, blood vessels, cartilage and all — and move the new nose to where his current nose sits. That is only slightly different from current methods of nose reconstruction, Cangello told LiveScience. Though reconstructive surgeons would also put tissue expanders under the forehead skin to stretch the skin enough to cover the new nose, they would place the nose differently. "We typically take the cartilage from the rib, and we put it right where the nose structure would already be, and we bring the skin flap over it and cover it," Cangello said. "We like to use similar tissues to reconstruct organs within the same area," Cangello said. The forehead is also enervated with blood vessels that nourish the tissue transplant, so the surgeons don't have to disconnect and reconnect those vessels to place the nose in its correct position. If the doctors were to grow the nose on a forearm or a leg, for instance, they would have to undertake a laborious microsurgery to take the blood vessels that feed and drain the transplant. "To be honest, the little nose that he has almost looks more in harmony than what they have on his forehead," Cangello said. But the new nose should shrink once it's in place, he added. It's also possible the researchers needed to replace the man's current nose because he had trouble breathing properly. "Whenever we perform a reconstruction, there are two things in mind," Cangello said. "It's not just form, but it's also function."